The Scootacar Mk1 from 1957 used a two stroke 197 cc Villiers engine. The Scootacar featured two wheels up front and one central rear wheel. Seating was tandem and the microcar was capable of 45 mph. The car featured scooter type handlebars - hence the name. 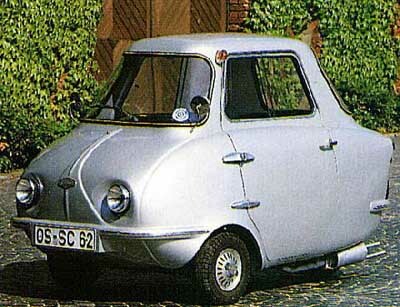 In 1960 the Scootacar MK2 appeared, this model was more rounded and had a longer rear end. The Scootacar pictured is a MK2.